Placing the Lying Leg Curl Machine in your outdoor facility is an easy way to bring low impact exercises out under the sun. The two person fitness machine is minimally resistant and perfect for retirement communities, rehabilitation centers or senior citizen neighborhoods where healthy activity, slow rehabilitation, and a sense of community can be encouraged. The state of the art finishing process used on the Lying Leg Curl Machine combines the application of an 'Electrocoat Zinc Rich Primer' with a durable polyester powder-coat top layer to ensure every crevice and joint is completely sealed, providing full protection against	corrosion and weathering. 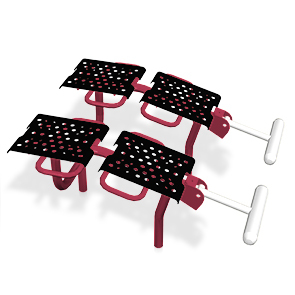 Lying Leg Curl Machines are finished in either a gloss or textured polyester powder-coat finish. To use, lie on stomach on bench, grasp handles with hands and place ankles under foot holders. Bend legs slowly. Hold and return to starting position. Repeat as desired. High repetition can help strengthen and tone leg muscles.